As much as I like to be thrifty... I think I like the expensive ones better this time. I think its the color? OMG they're identical! That's crazy. Definitely need to buy those from Forever! I could totally see them with a pair of jeans and a white t-shirt. Hmmm... I'd say Forever 21. Such a sweet Forever 21 find! I love these wedges!!! & Forever 21. I'd get the Forever 21 ones. It's so much less expensive! I cannot wait to wear these with a skirt in the spring! These look great! Forever 21..oh yeah! I love these wedges...must search my forever 21s for them! Ps. I am loving the new look! Super cute!!! other than that they are identical. Gosh they are identical, gotta love F21 for stuff like these, I know nothing compares in quality and comfort to the real ones, but those look alikes will do the trick, great fing girl! F21 has always great bargainssss !! these shoes are gorgeous ! Oh F21 all the way!! If I am getting Wang, it's that fab studded bag!!! I will gladly take the $530 I save and apply it toward that!! Wow! I must say I have to go with the F21 shoes again!! I'm a thrifty kind of girl who cannot afford the expensive pieces, so Forever 21 is my pick. Neither are my style, but if it's a fad, I"d get F21 and if I were to wear them beyond a season... I might splurge on the Wang... but only on sale! I do have a general rule not to wear faux leather shoes though. I want those shoes right now!!! Erika, I forgot to mention this yesterday, but I love the new layout! You did a great job! These are so sweet! Oh thank goodness for Forever 21! Nice price at Forever 21! You amaze me yet again. I love the forever 21 pair and the price! Perfect for the wide legged jeans I am currently smitten with. Even though the F21 is a great replica, you can notice the difference in quality crftmanship with the Alexander Wang pair! Fabulous f21 find, darling E! although i do like F21, i promised myself i wouldn't ever buy shoes from there again. and the ones on here are super cute--but i'm going for the Wangs! I'll save on these -- they're so pretty and similar! I almost bought those from Forever 21. I love how they look, and think they woudl be perfect for the upcoming 70's trend. Love them both but i think i am going for the cheaper version. Erika! I love the new blog design! So neat and clutter-free! Sweet. The F21s seem a better deal and in fact I even like their colour better! Erika your new layout looks fantastic!! Congrats!! and on the F21...once again they pull it off! Erika, we have to splurge a little in this particular contest. The Alexander Wang gets my vote. I like the color and texture! These are so so soo fantastic! Ugh to be able to wear wedges. But these are like clog wedges. SO maybe I can do those?? Oh, it's F21 again! Yep, my least favourite label... I've gotta go with the Wangs here. i can never find anything good at forever 21 but i m thinking im having to buy these heels! but alexander wang is my favourite i would just die if i owned a pair of his shoes!! 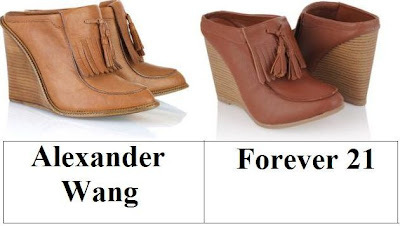 I haven't had much luck with F21 shoes so I'll have to go with the A. Wangs! Ummm Yes to the F21 pair!! They are really lovely. But I wonder, am I going to walk right out of these? I'm going to go with F21 as much as it pains me to say it because I don't really like buying shoes from there... ask me in 10 years and hopefully I can say Wang! Ooh. I do not like either of them. It's the fringe. I've never been a fan. Hope you had a good Thursday. I actually prefer the F21 pair. I've never owned any Forever 21 shoes though - How do they hold up? good eye! i love the F21. I'll be thrifty and go for the Forever 21 pair. They're both so identical! The Wangs for sure. J'adore them! I love the colour of those wedges. I love the Forever 21 ones! So pretty. Those are very interesting shoes, E! Did you buy a pair? I don't think I would wear these. The Forever 21 pair look awesome and for the difference in price it's a no brainier which to choose!